Valerianella radiata (L. ) Dufr. Stems: Erect, dichotomously branched distally, glabrous or sparsely pubescent on angles, not prickly. Leaves: Basal and cauline, opposite, simple; stipules absent: petiole absent; blade spatulate to oblong or lanceolate, .2 to 3.5 inches long, .16 to .86 inch wide, base connate, margins entire or remotely dentate proximally, minutely ciliate, apex rounded. Inflorescences terminal, cymes; bracts 2. Inflorescences: Cymes, terminal; bracts 2. Flowers: Calyx lobes 0; corolla essentially radially symmetric, white, funnelform, 5-lobed, .06 to .08 inch, obscurely gibbous abaxially on tube; stamens 2, anthers exserted; stigma 3-lobed, exserted. Fruits: Achenes, yellow, ovoid, .06 to .08 inch, glabrous or hairy, not crowned by calyx; seed 1, .05 to .07 inch, smooth. 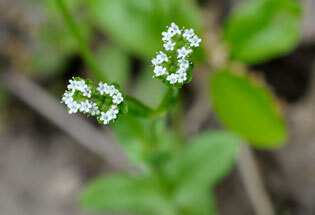 Comments: Valerianella genus Valeriana + diminutive suffix and radiate, having rays, alluding to the inflorescence. Formerly treated as Valerianaceae, the Valerian Family.